January is glaucoma awareness month, and increasing awareness of this sight-threatening disease is very important. It is currently estimated that there are more than 3 million people in America who are in some stage of vision loss associated with glaucoma, and, while some cases are more extreme than others, early identification and treatment are paramount when your eyesight is on the line as this disease can leave its patients completely blind. Glaucoma is the leading cause of all irreversible blindness, and sometimes there are no symptoms prior to complete vision loss. The World Health Organization published an article stating that they estimate the number of people who have currently gone completely bind as a result of primary glaucoma to be around 4.5 million, and there are an estimated 60 million people who have glaucoma worldwide. There are two types of glaucoma. The first, primary open-angle glaucoma, is the most common type. It comes on slowly and is the result of the eye not being able to drain fluid as efficiently as it should. When the eye is unable to drain the fluid, pressure builds up which can damage the optic nerve. Although it sounds as if it could cause some sort of discomfort, this type of glaucoma is painless and does not hinder eyesight at first, leaving few warning signs that can be seen without an eye exam. It is for this reason that regular eye exams are important, and you should see your optometrist regularly. The second type of glaucoma, closed or narrow-angle glaucoma is markedly different from open-angle glaucoma. Narrow-angle glaucoma results from the iris being very close to the drainage angle of the eye. The drainage angle is the angle between the iris and the cornea, and when it becomes blocked in this manner it immediately becomes an emergency as blindness can quickly follow once symptoms show. The symptoms to watch out for with narrow with narrow-angle glaucoma are as follows: sudden blurred vision, severe eye pain and headache, nausea, vomiting, seeing rainbow colored rings or halos around lights. Since the 1970s, scientific research has shown that cannabinoids can be effective in decreasing intraocular pressure or IOP. IOP is the term used to describe the pressure caused by narrow and open-angle glaucoma mentioned earlier. While it is widely accepted that medical marijuana can help alleviate IOP and symptoms related to glaucoma, researchers are still trying to define which method of delivery of cannabinoids is most effective for treating the disease. When smoked (a route of administration not approved for medical cannabis use in the state of Florida), cannabis has the potential to reduce IOP and glaucoma symptoms for around 3-4 hours. Some ophthalmologists are hesitant to recommend medical marijuana as a form of treatment for glaucoma, though, because symptom management for glaucoma is a 24 hour, daily process. However, studies have shown that medical cannabis can lower IOP anywhere from 25 to 30 percent. This method of cannabinoid delivery has shown to be effective especially in combination with regular glaucoma treatment to help ensure consistency, and mitigate the concerns of medical professionals who are slow to embrace cannabis in treating the early stages of glaucoma. Especially once glaucoma has reached advanced stages (impending blindness for the patient), medical marijuana is widely-accepted as a treatment option for the symptoms of glaucoma. 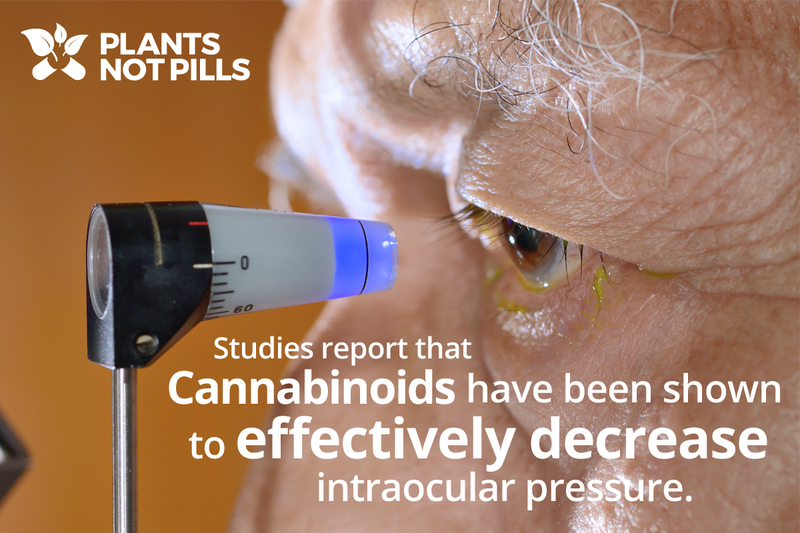 Research is ongoing to determine even more effective uses of medical cannabis in the treatment of glaucoma. To schedule an appointment with a qualified medical cannabis physician in Florida, click here or call us at (800) 203-5124. Or, click here for more information about for answers to commonly asked questions about medical marijuana.